This 2 Ton Folding Cherry Picker is a great engine hoist. It is very good to have in your garage for lifting engines and heavy objects. This engine hoist is made out of premium steel, which means it stands sturdy and will lift with ease. The boom range is 102″ from the floor. The closed boom capacity of this engine hoist is 2 ton, and maximum height is 48″. The extended boom capacity is 500Lb is the extended boom capacity, and the maximum height is 102″. You can read more about it here. This engine hoist is perfect for working in areas where space is limited as it can be folded, and it has 360 degree moving wheels which allow for easy maneuverability. The working dimensions are 65″ x 41″ x 37, and when it is folded 58″ x 37″ x 22″ which means that it can easily be stored easily in your garage when you are finished with it. Obviously it has a lifting capacity of 2 Ton (4000Lbs) which is quite significant. 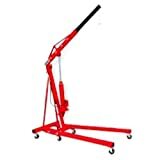 It’s uses are quite versatile as it excels when lifting engines, however is also useful for general movement of heavy items in your workshop or garage. Comes with a relatively inexpensive price tag, (Around $170 – $220 mark). Click here to get an exact price. It is a light weight version of 2 Ton Foldable Engine Hoist Cherry Picker Crane Lift w/ 8 Ton Hydraulic Ram, and it was designed especially for smaller garages, and it also fits the needs of people that aren’t mechanics. It is very easy to use, and for this price it is a great engine hoist. Something to think about is the build quality of this hoist. Although it performs the job of lifting heavy weights with dexterity, when it comes to it’s assembly and general lifespan the old adage is somewhat true ‘you get what you pay for’. However, it is an attractive price tag, and if you aren’t planning on swapping out engines every other weekend, that may not be a big deal.